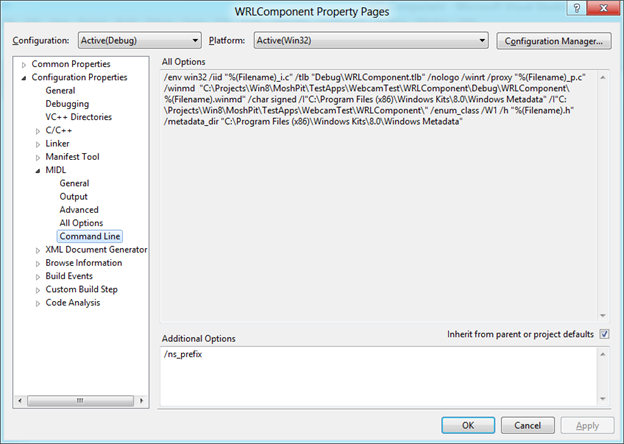 Microsoft provided a few sample WRL C++ Projects. 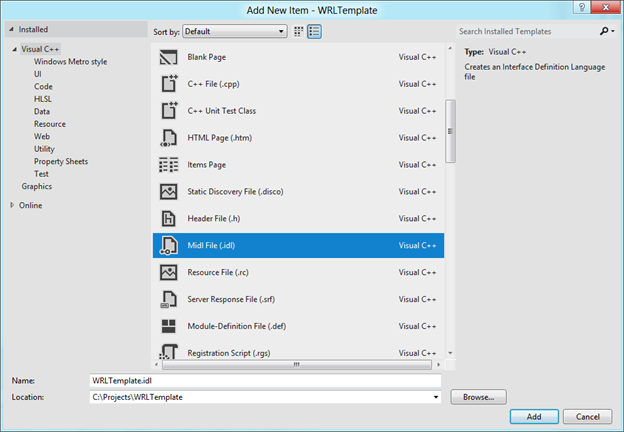 However they did not include a WRL C++ Project Template in the Visual Studio 2011 Consumer Preview. 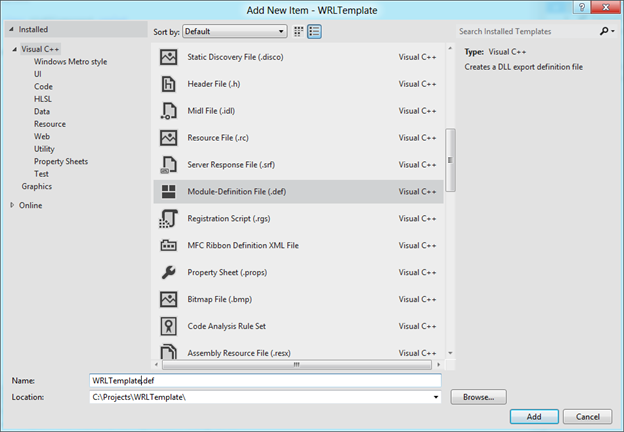 I reverse-engineered the Sample Projects to find out what is necessary in order to develop a WRL Component from scratch as I didn’t want to use the available Sample Projects as my Project foundation. 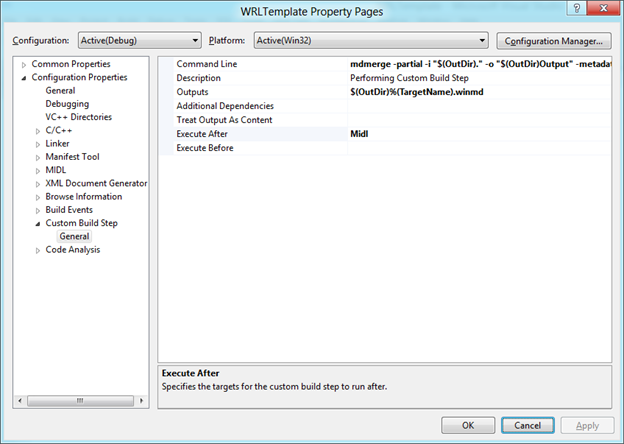 I also modified the Project in a way that the resulting DLL contains not only the COM component itself but also the proxy/stub implementation. 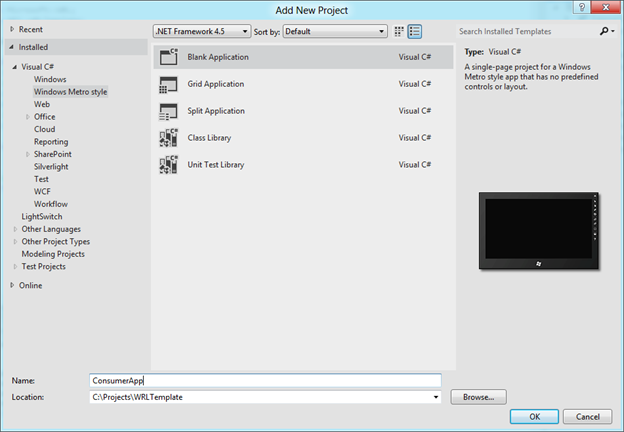 Create a new “Visual Studio C++ – Windows Metro Style – WinRT Component DLL” Project. I called it “WRLTemplate”. 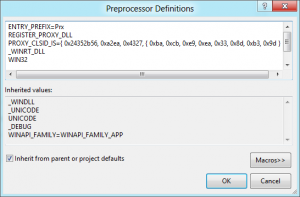 Delete the automatically created WinRTComponent.cpp/h files. 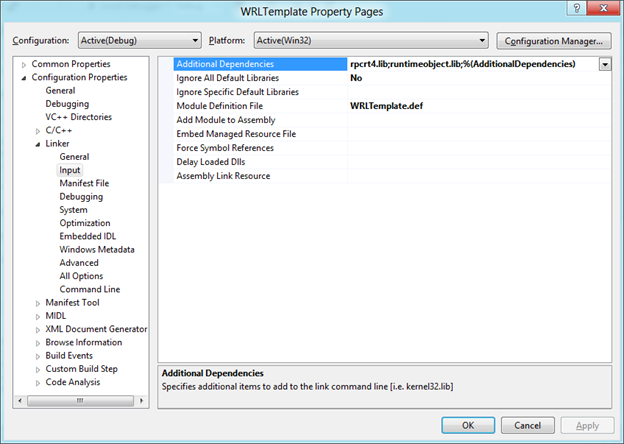 Add the MIDL File “WRLTemplate.idl”. The content will be added later, when we define the modules’ functionality. 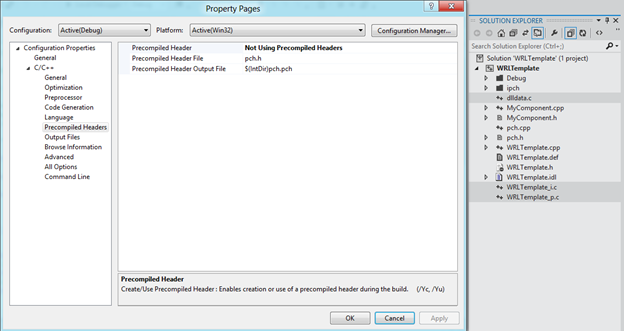 This will add the “ABI” Prefix to the generated namespaces in the proxy/stub files. Try to compile. It will fail. 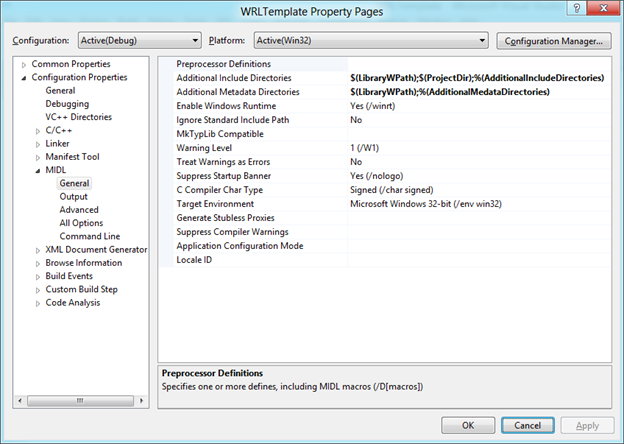 Add Reference to the winmd file. 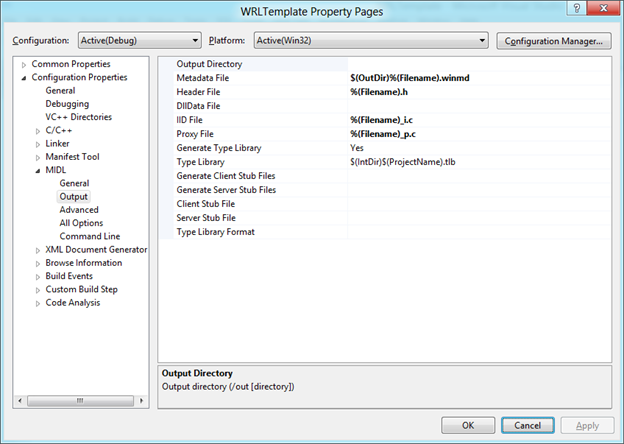 Make sure you do NOT select WRLTemplate.winmd from the Output folder. Although they are binary equal you will get an exception at runtime, telling you that the Type is not registered. If you have specific questions regarding any of these settings please post a comment and I will get back to you. 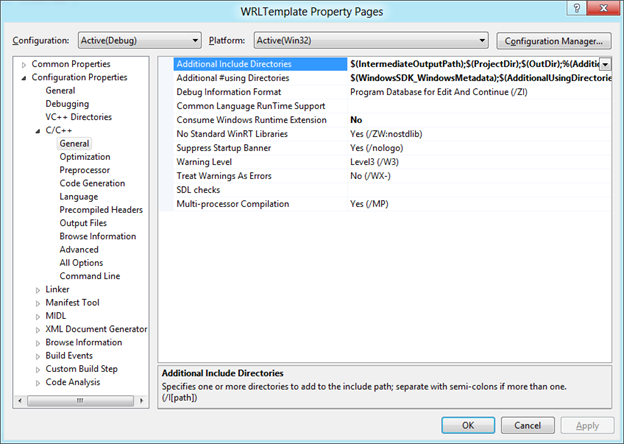 I attached the example solution (WRLTemplate). 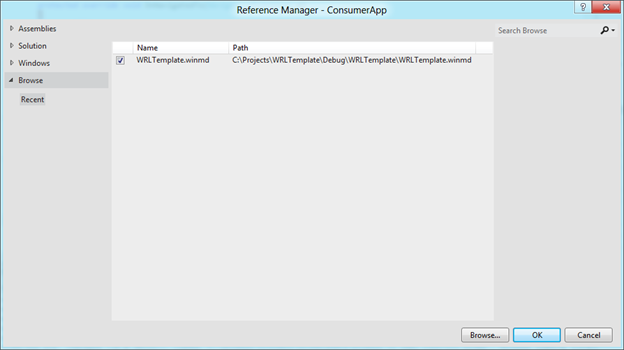 Please note that you will have to compile the project “WRLTemplate” and again reference its WRLTemplate.winmd afterwards in the ConsumerApp project. Great. 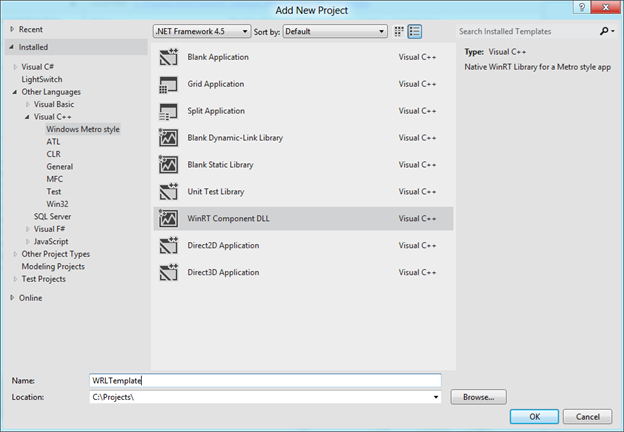 For your info, I created a project template for Visual Studio, starting from your initial settings. I changed few of them and created the configurations for x86 and x64. Your name/this blog post is referenced in the readme.txt for credits. 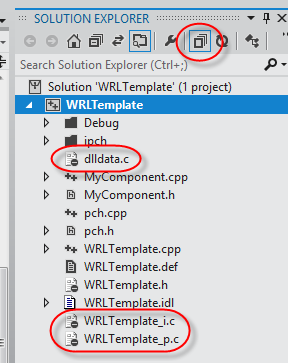 but now, i try it on Window 8 Release Preview (Build 8400), i implement folow this article, because, at step 19, i not found 3 files: dlldata.c + WRLTemplate_i.c, WRLTemplate_p.c. Thanks for writing up such great step by step tutorial. It helps a lot. 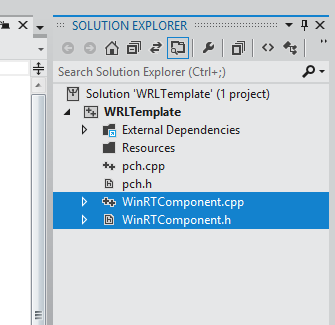 I am asking this, as I have a C# consumed C++ component, which needs to access WinRT APIs. When I turn on the feature, I get compilation error as follow. “Fixing” compilation error will further lead me to runtime error. Thanks for the walkthrough. You called out adding rpcrt4.lib as an additional dependency, but not runtimeobject.lib. For me runtimeobject.lib wasn’t a dependency of my dll by default (or I must have cleared it accidentally), so I had to manually add it. If anyone has linker errors (error LNK2019: unresolved external symbol _WindowsCreateString@4 …) for WindowsCreateString, WindowsDeleteString, or WindowsGetStringRawBuffer, this is the cause. Thanks for the post. In DllCanUnloadNow, are you sure you should call module.Terminate(), rather than module.GetObjectCount()? I see that Terminate() actually returns GetObjectCount() == 0 ? S_OK : S_FALSE, but it actually cleans up some stuff, where DllCanUnloadNow normally just checks if the object count == 0 and doesn’t do clean up. 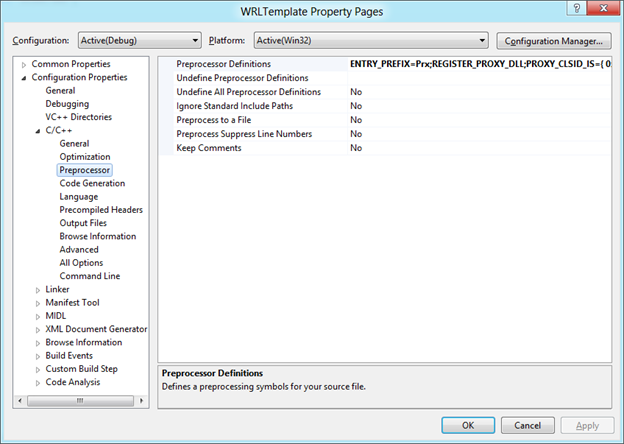 Also Terminate is called from DllMain if DLL_PROCESS_DETACH == dwReason, so should we be calling it from DllCanUnloadNow? The VS templates don’t use Terminate either, they all use module.GetObjectCount() == 0 ? S_OK : S_FALSE. Not sure myself, so I am hoping someone can clear it up. Richard, on the impl of DllCanUnloadNow() question, both implementations that you see are correct. The one that calls Terminate() avoids an issue that comes up with cached class factories that hold other objects; a rare issue so unusual to need to do this. the call to Terminate (or any COM calls) from DllMain is a bug.